What Can Cellular Automata Tell Us about the Behavior of Large Multi-agent Systems? This paper describes the behavior observed in a class of cellular automata that we have defined as “dissipative”, i.e., cellular automata for which the external environment can somehow inject “energy” to dynamically influence the evolution of the automata. In this class of cellular automata, we have observed that stable macro-level global structures emerge from local interactions among cells. Since dissipative cellular automata express characteristics strongly resembling those of open multi-agent systems, we expect that similar sorts of macro-level behaviors are likely to emerge in multiagent systems and need to be studied, controlled, and possibly fruitfully exploited. A preliminary set of experiments reporting two ways of indirectly controlling the behavior of dissipative cellular automata are reported and discussed w.r.t. 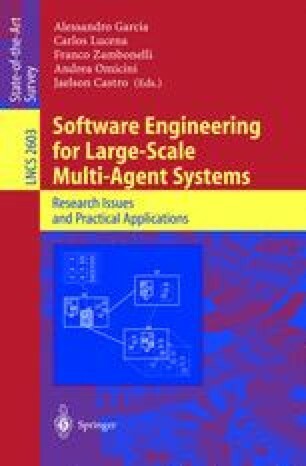 the possibility of applying similar sort of indirect control on large multi-agent systems.